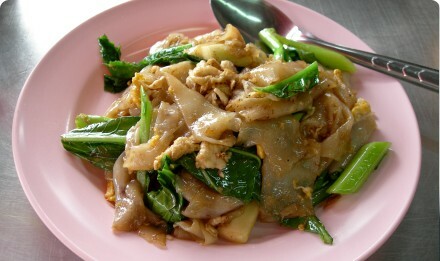 Pad See Ew is a common street-food noodle here in Central Thailand. See Ew is a Southern Chinese word for soy sauce. This dish literally means ‘stir fried soy sauce’. In Thailand, it’s usually served with thinly sliced pork or chicken and Chinese Broccoli. Rarely do you see other vegetables. Separate the noodles from each other, and place on a plate. 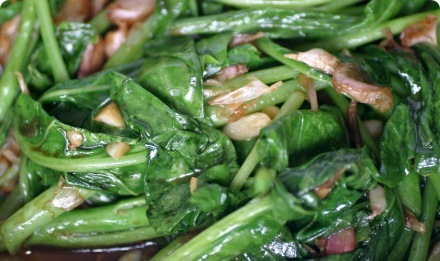 Cut the Chinese Broccoli stems at an angle so they cook easier, in about 2″ (5cm) long pieces. Make sure to clean well. Fry the garlic on high in the oil until lightly browned and fragrant. Add the pork (or chicken) and fry until cooked through. Keep stirring so the garlic doesn’t burn. Add the noodles. Keep stirring so they don’t stick. Add the Chinese Broccoli, and mix well. You may need to add a little bit of water so everything cooks & doesn’t stick. Don’t add too much that the noodles get clumpy though. Add around 1 teaspoon at a time. When the Chinese Broccoli is cooked (leaves are wilted and stems are darker green, about 1 minute), add the soy sauces, sugar and white pepper. Mix well. Push the noodles to the side and add a little bit of oil to the pan. Crack the egg into the pan on top of the oil. Scramble in the pan and let sit until solid. Break it up a bit and mix with the noodles. Dish out and serve with soy sauce, sugar, vinegar, chili powder and white pepper so you can flavor to your taste preference at the table. If cooking more than one serving, cook them one at a time. If you cook too many noodles in the pan, you'll get a big sticky glob. The fresher the noodles the better. If you're lucky enough to get fresh wide rice noodles, unrefrigerated, keep them out of the fridge when you get them home and cook them that day. Once refrigerated, they tend to break apart very easy when you cook them. You can also make pad see ew with thin rice noodles, sometimes called 'rice sticks'. If you're doing that, pre-soak them until softened, about 10-20 minutes, before frying. You may need to add more soy sauces because there is more noodle surface area to cover. It's important in this dish that the garlic doesn't burn. If it does, it will be bitter and not tasty. If you're a bit unsure how to stir fry, you may want to fry the meat first, so it's cooked, then re-add it to the pan after the garlic is ready. For your Pad See Ew recipe, can you recommend a good brand for the black soy sauce? I have Pearl River Bridge’s Superior Dark and Light Soy Sauces, but as you recommend to not use Chinese soy sauces in Thai cooking, I was wondering what brands to look for. As for the white soy sauce, all I can find at my local store is Healthy Boy Mushroom Soy Sauce, will this affect the flavor too much? For the dark soy sauce, I recommend Nguan Chiang brand (I nicknamed it boat brand because there’s a steam boat on the label). Make sure it’s the non-sweet kind. If you can’t find that, any Thai dark soy should work. Were there any other brands of white/light soy available at your store? If not, the Healthy Boy Mushroom soy sauce should work fine. It has a fairly strong shittake mushroom flavor, but it’s tasty. I don’t think it’ll ruin the flavor. Hi, i absolutly love this recipe. I hate to be a downer, but where the heck is the nam pla? How can any dish be a real Thai recipe with no fish sauce? This dish is called Pad See Ew which means “stir fried with soy sauce”. 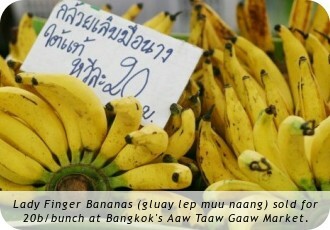 It’s Chinese in origin – not originally Thai. I’m sure there are some cooks in Thailand who add fish sauce when cooking this recipe. But there are plenty who do not. If you’d rather use fish sauce, cut down a bit on the light soy sauce, maybe go 1/2 and 1/2. Chinese? I guess that explains why I never saw the dish in China when I lived there and I’ve seen it in every Thai restaurant I’ve been in and heard that serve it on the streets all over Thailand. Is Pad Thai also Chinese? Pete, its not called Pad See Ew in China because they dont speak Thai In China!! I think you’ll find its called Char Kway Teow in Chinese. The dish originates from the Teochew people of Guangdong Provence, in Southern China, who emigrated to Bangkok about 2-3 generations ago. Bangkok has a huge number of Chinese, and Chinese-Thais. The word see-ew is from the Teochew dialect. And funny, I know you were being sarcastic, but Pad Thai is also of Chinese-Thai origin. Noodles were brought over by the Chinese, and they created a dish while here for “Thais”. Pad means to stir fry, so “stir fry Thai style” would be the literal translation of the name. I just did a quick search on the internet and found an article by the chef David Thompson where he mentions the origins of Pad Thai: http://gourmettraveller.com.au/talking-thai-david-thompson-on-thai-street-food.htm – you have to scroll about 1/2 way down the page. And finally, there’s no need to be rude. This site is a free service, and I spend a lot of my free time researching and creating this site to help teach people what I’ve learned while living over here. I’m no expert in anything but I do double check everything I put up here and feel it’s as authentic as possible. And what about the chinese broccoli? Not sure i can find it in UK.. Any ideas what it could be substituted with? Thanks! Very nice. I doubled the amount of sauce as I realized the amount of noodles & broccoli I had was at least two portions. Thanks for the recipe! Is there egg in this dish? it looks like there might be from the picture. If so, when should it be added? thanks! I was reading the ingredients needed for pad see ew….what is “sen yai”? I’ve seen other recipes use brown sugar instead of white sugar. Do you recommend this? Does it give the noodles a different flavor? if you see people cooking this on the street here in thailand, you’ll see everyone using white sugar. but that aside, feel free to try it both ways to see which you prefer. yes, it will change the flavor. Can you tell us what happened so maybe we can figure out what went wrong? can you cook the noodles before hand and then mix it in, cause im afraid it might stick together, turn lumpy or mash up! Thank you for all you do. I realize some people can be very rude, but most of us appreciate all the time you take putting up these awesome recipes. I have made several dishes from your website, including pad see ew, and they turn out as good if not better than most Thai restaurants I have been to. Thank you so much for all your recipes. I’ve tried a lot of them and I loved them! hi, yummo was the food. I hope you did not use the rabe, if you used regular broccoli. Thanks for publishing this website (and for free)! I tried this recipe tonight and it tasted like I spent $10 at a restaurant. And it was so easy! Thank you so much for sharing these recipes, I love being able to make my own Thai food! I’m looking forward to making the curries next! Greg, I can’t imagine why you would cook regular broccoli any differently than Chinese broccoli….maybe add an extra minute of cooking but other than that I’d say everything else is the same. great recipe. I am currently living in Thailand and eat this all the time. Thanks for the great recipe, I’m giving it a go tonight. I’m a little nervous because I can’t find any Thai dark soy sauce where I live. I can only find Chinese. Do you think the flavour will alter greatly? If so, do you know any ways I can counteract the imbalance? I just came back from Thailand thirsting for authentic recipes. My family and I found this recipe to be our favourite whilst there. I can’t wait to give it a try. Thai brands are hugely preferred, but you have to make due I suppose. 🙂 Best advice I can give is to try to find a Thai grocery online to order, or search for a SE Asian grocery in your area. Thank you for the site and the recipes! I live in Hong Kong where there is no dirth of jet fresh Thai ingredients, but for some reason most of the Thai restaurants serve terrible food. What I make at home consistently blows away anything I get served at restaurants for about half the price! I practically live off Thai food!